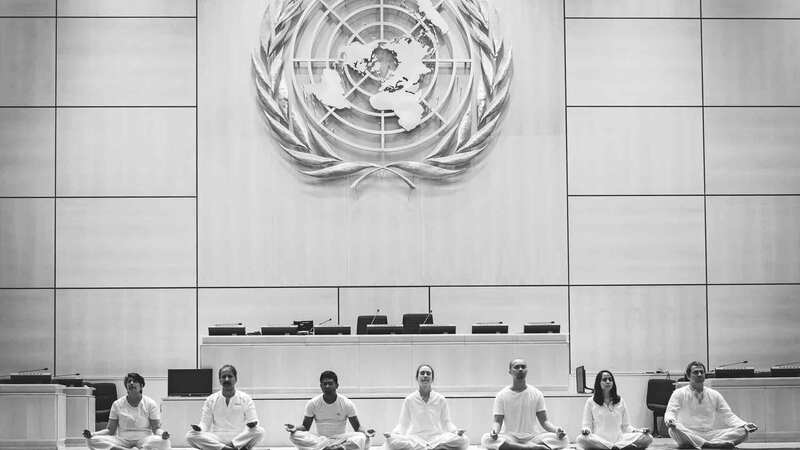 Michelle, an Isha Hatha Yoga teacher and volunteer in Switzerland, shares her experience of teaching yoga at the UN campus, Geneva, leading up to Yoga Day. “Yoga promotes the principles of peace, rights and wellbeing that the community in international Geneva is working towards on a daily basis”, said Michael Møller, Director General, United Nations Office at Geneva, addressing the gathering at Palais des Nations, Geneva, at the first celebration of the International Day of Yoga (IDY) on 21st June 2015. As an Isha Hatha Yoga teacher and volunteer with Isha Foundation, I was the Switzerland country-coordinator for Isha’s IDY activities last year, which included 2 programs of Isha Upa-Yoga practices, in Lausanne and in Zurich, as well as partnering the Permanent Mission of India in Geneva for the UN event. The diplomats themselves came up with the idea of practicing yoga in different sites in Geneva connected with peace. And so, the June 12th event “Free Yoga for Peace” was born! Sitting on the United Nations terrace, in brilliant sunshine, I was thrilled to hear Mr. Møller’s acknowledgement of the importance of yoga, not as an exercise form, but as a means of transformation, to an audience consisting largely of Ambassadors, Permanent Representatives and officials from various UN and other international organizations based in Geneva. If leaders can experience the union or the yoga of life, there will be a dramatic change in the way the world will function. This year, on behalf of Isha, I have again been working closely with the Indian Mission to make yoga accessible to even more people. A few months ago, I had a brainstorming session with diplomats from the mission, to see what curtain raiser for IDY would inspire people to bring yoga into their daily lives. The Mission helped us gain entrance to the United Nations. Only a small number were allowed in, but the number was auspicious. We had seven yoga practitioners, the same as the number of people Adiyogi Shiva first taught yoga to, the Saptarishis! I invited people who had learnt Surya Kriya and Angamardana with me, so we could do diverse practices together. I’m sure these security guards have witnessed many things, but never yoga in the General Assembly room! That was really making history! This has been one of the wettest Junes I can remember, and it started to drizzle as we entered the UN gates. We had planned to do yoga by the flags, but not in the rain! Security were exceptionally helpful, and offered an alternative venue – nothing less than the General Assembly room! A security guard accompanied us the whole time, so there was time to chat a little as we moved between venues. He was curious about yoga and India, and happily accepted an Isha brochure to read that evening. I’m sure these security guards have witnessed many things, but never yoga in the General Assembly room! That was really making history! Our volunteers were very excited to be in a place where really far-reaching decisions are made, and couldn’t resist taking a few selfies! But as soon as we laid out our mats and did the invocation together, the atmosphere in the space changed entirely. It was an amazing experience to bring such meditativeness to the hall. We were honoured to have a very talented photographer with us. Sandip De, who is going to be the official photographer for the United Nations event on Sunday, volunteered his time to help promote yoga, and captured the moment beautifully. We then went to an adjoining room and did some more dynamic practices. The room was on an upper floor, with a view over Ariana Park, and the Celestial Sphere, one of the symbols of the United Nations, donated in 1939 by the Woodrow Wilson Foundation, in honour of the UN’s founding father. Next, out onto the terrace, where the skies had cleared somewhat. Beyond the park, we could see Lake Geneva, although the Alps on the other side of the lake were still hidden by clouds. Finally, we did make it to the flags, which represent all the member states. It was a great feeling to do yoga on the soft grass with the UN building behind and the flags flanking us. Gandhi famously said: “Be the change that you wish to see in the world.” Of course, yoga offers practical tools to bring about that change. As you walk up the ramp to the museum entrance, you encounter a group of shrouded, life-size figures by Swiss artist Carl Bucher. The piece, called “The Petrified,” represents the faceless victims of human rights violations. What a place to do yoga and change the energy from fear to bliss! This second part of the afternoon was for Isha’s 5-Minute Upa-Yoga practices. As I am a Hatha Yoga teacher, I don’t need to use videos to teach. I can teach the practices live, and Sadhguru says these practices can be taught anywhere, but I’ve never taught in such a setting! The people who joined in were from many different countries and backgrounds: we had interns, bankers, a project manager, a nutritionist and others, from Switzerland, France, England, Chile, Switzerland, Germany, India, Pakistan and the Philippines, to name but a few! We did some simple yoga near the sculpture, and before we knew it, it was closing time at the museum. Last stop, the Gandhi statue: a gift of the Indian Government to the city of Geneva commemorating the 60th anniversary of Indo-Swiss friendship (Treaty of Amity, August 14, 1948). Gandhi famously said: “Be the change that you wish to see in the world.” Of course, yoga offers practical tools to bring about that change. Another very fitting place to practice yoga. And in the short time we were together, the participants definitely felt a change! Though we’d only done very simple practices, people said how inspired they were to learn more yoga. They loved the fact it wasn’t physically demanding, and that we explored dimensions connected with energy and the emotions. Everything conspired to make such a beautiful day for all. It was an experience I will treasure. The Turning Point in My Life? Pavan, a hairdresser from Noida, shares how attending an Isha “Yoga For All” session is the best thing he has done in his life.